A day earlier than expected a good-sized box arrived with An Aran for Anne and An Aran for Frederick, as well as my tear sheets and copy of Jane Austen Knits Summer 2012. Even better was a sweet note from Amy, the editor. The magazine, in case you haven't seen it, looks great! I can't wait to spend some quality time with the articles and patterns. Of course today would have to reach the 70s with humidity over 80%, so I will not be modeling the prodigal sweaters any time soon, though I have been trying on the current project, which may be a Knitty submission, if I can finish it to my liking in time. It's been interrupted by some freelance graphic design work and a bunch of inaugural-presidential "stuff" for Penelope's preschool. And therein lies the problem, I think. I've had time to think about this knit, which leads me to think of making changes, which stops me in my tracks and makes me think more. But I think it's good; now to just get it done. Doesn't that look yummy? 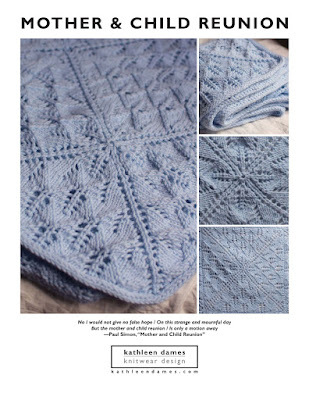 I was tempted to just get more Filigree, as seen on that adorable model, since it was an awesome colorway to work with, but I thought it might be fun to try something new, something not blue (I know: who am I and what have I done with Kathleen?). So, Byzantine is a rich, spicy red, and the good people of Knitty City had enough of it (and, after The Best Day Ever, I was in need of some instant gratification!). I'd like to orchestrate a KAL for Sotherton, if anyone is interested (I know Annie*, my enabler, is - we texted back and forth about this yarn while I was in the shop). I'll post details in a week or so, and it probably wouldn't start until at least mid-June, though it might be better to wait until Fall. I'm used to having a pile of wool in my lap throughout the Summer, but not everyone is crazy like me. We'll see. *We're going to enable each other into some SABLE (Stash Acquisition Beyond Life Expectancy) in a couple of weeks when we meet up in WEBS country for a little ladies-only adventure. No kids, no spouses - no offense. Just some girl time in the yarniest warehouse in the East. A spicy red Sotherton sounds hard to resist! Congratulations on these beautiful designs.